movie | Who Said Life Wasn't Complicated? Youth workers, stop using 2 minute video clips! On Wednesday 16th of November, I will be teaching another lecture to the youth work honours students (and anyone else who wants to come along) at the International Christian College in Glasgow. The subject will be ‘youth work and film’ and I will be showing my short film, “prodigal” (see trailer below) and then talking about how we use film with our young people. one of the issues I want to explore is the ethics of the two minute film clip. You know what I mean. We all do it. We pick a scene from a film that matches up with the point we are trying to make with our talk. Seems harmless doesn’t it. But what does that communicate to young people? Postmodernism has often been described as the pick and mix ideology. We pick what we like from here and there and build our lives around it. Postmodern religion would be picking bits from all different religions and creating a hodge-podge of spirituality. And most of us would say that’s wrong. For years, christians have cherry picked verses from the bible that suit their theology and ignored the ones that they disagree with. And most of us, even though we do it from time to time, would say that’s wrong. But then we come to film. And somehow it’s okay to cherry pick bits from films that fit our views and ignore the rest. Well I say that’s wrong! I believe that we need to move away from cherry picking film clips and instead show the entire film and let the film speak for itself. Yes, this is harder. Yes, it means that we need to find news ways of doing illustrations, but I believe it is more ethical. As a filmmaker, I want people to watch my whole film, not just bits that fit their sermons, and wrestle with all the themes that come out of it.Yes they may not agree with everything in them but that is good for discussion. So that’s what I’ll be exploring and I hope it will be a lively discussion. If you’re interested in coming along, please let me know. Over the years I’ve made a number of little short films. Many of these I have used with youth groups to spark discussions. And I wanted to make them available for other groups to use. Included here is an embed to the short film and some basic discussion questions. If you would like a ‘hard’ copy of the films then please message me and I can get one done for you. The cost would be £5 and all funds would go towards making another short. A man’s life is turned upside down when he is mistaken for the musician moby, by an obsessed moby fan. For me, the film is about identity. Where do we get our self worth from? Who tells us who we are? What we’re meant to think, how we’re meant to act? If someone tells you, you are something enough times, will you start to believe it? Draw a large body on a piece of paper (draw round a young person if someone is happy to do it) give you post-it notes and get the young people to write one thing down they would like to change about themselves and stick it on the person. 1) have you ever believed something that someone said about you that wasn’t true? How did it make you feel? 3) What are things your parents or friends say that makes you feel good/ bad? 4) Are there things you would like to do but or worried to because of what your friends or family might think of you? Just like Jesus, we are loved by God not by how we dress, or what we do. We are loved because of who we are. We are loved because we are children of God. Take a look at yourself in the mirror. Take a look at the Truth (positive) and Lies (negative words) next to the mirror. Which list do you associate more with? Do negative views stop you living life to the full? Take a copy of the positive column and over the coming week, look at these words of truth. A man awakes alone on a beach, haunted by a figure in black. For me, the film deals with a number of themes including hell and the choices that we make in life. The character in the film commits an act that haunts him for eternity. He becomes trapped in his own personal hell because of the guilt and shame that has built up. 1) Have you ever felt the way the man in the film does? 2) Where do you think the man is? Is he in hell? What is hell to you? 2) What kinds of things do you feel guilty about? 3) Do you struggle to forgive yourself for these things? Why/ Why not? 4) Do you think God can forgive you for these things? 1) Fill a large jar with water and have a number of small soluble tablets. Ask the young people drop the tablets into the water and watch them dissolve, explain to them that this is just like God forgiving the bad things they have done. an interactive flash confession created by Jon Birch. Type in your confession and watch as it is launched into space and be absolved. I saw Prince of Persia last week. It’s not going to win any awards but it was a bit of hollywood fluff that didn’t outstay its welcome. 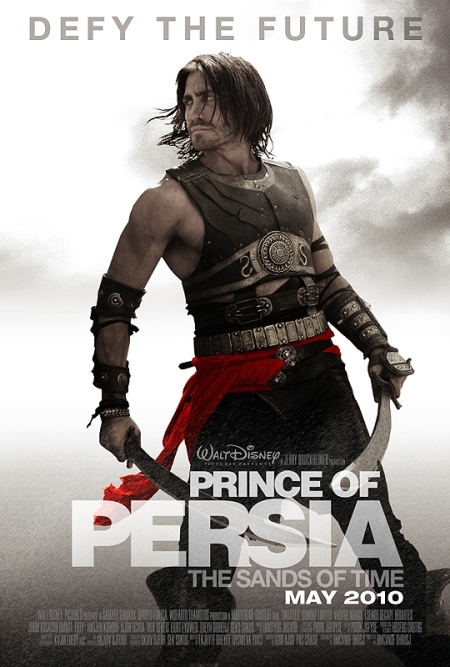 The film follows the exploits of Prince Dastan, a street orphan, who is adopted by King Sharaman of Persia. Through a series of events, he is forced to go on the wrong after being wrongly accused of the murder of his adopted father and comes into possession of a dagger that control time. By pressing the button on the dagger he is able to travel back in time by one minute, but if it is inserted into a certain holy wall then he can travel back as far as he wants. How many of us have ever wished they could travel back in time? We’ve done something or said something that we later regret and wish we could go back and sort. But it got me thinking about a more interesting idea. At the end of the movie (spolier alert) Dastan goes back in time in order to prevent Hell on Earth (quite literally). He has seen what is going to happen and goes back and changes his actions accordingly. Discussions about God’s divine providence still go on today. How much does God know about what it is going to happen? How much is He in control of events? The Book of revelation has been often read as a guide to what is going to happen at the end of world. A kind of crystal ball. I’m certainly not convinced that was the aim of John when he wrote it but I understand how people can come to that opinion. What I do believe is this. The death and resurrection of Jesus brought about the start of a renewed creation. It showed us we are to partner with God in bringing about this new creation. I believe in the poetry and story of Revelation that one day God will dwell on earth and everything we do now will somehow have meaning then. Because we know how the story will end, we should live accordingly. Are we about bringing Heaven to earth or Hell to earth? What kind of world do we hope will exist when God renews everything? Let’s start working with God to bring about that renewed world now.